Visitor History feature keeps track of the history of pages visited by the visitor on your website. It is available in all plans. You can find Visitor History (available as hyperlink) in the meta information box over the chat window on your agent screen. Number count next to the visitor history is the total number of pages visited by the visitor and not the number of hops. 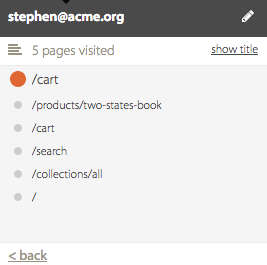 Clicking on the Visitor history hyperlink will show the list of pages that have been visited by the visitor. Red dot indicates the current page from where the visitor is chatting. Note: The order of the list of pages need not necessarily be the way visitor would have traversed but those are the history of pages he visited. Currently we display only recent 10 urls of the path that visitor has traversed before visitor initiates the chat. After the chat is initiated, visitor path is tracked for all the pages. 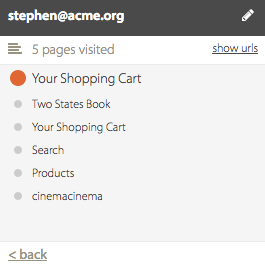 Clicking on 'show urls' hyperlink will show the url of the pages that the visitor has traversed on the website. Clicking 'back' or 'show title' button will take it to the previous state.